It was one of those ideas that seemed easy: to build a real size 1:1 scale of a PageOneX analysis. I just needed to buy 4 newspapers during 4 weeks, highlight certain stories, and put them on the wall. However, as it usually happens, things are easier said that done. I thought that buying the newspapers everyday would be the easy part, a question of self-discipline, but things are not what they seem. My first idea was to get them from the public libraries, but at the Cambridge Public Library they told me that they are forced to destroy them after 4 months. The next approach was to go buy them. It’s easy to find The New York Times at any corner. It costs $2.5 on week days and $6 on Sundays. It’s also easy to buy The Boston Globe, if you live in Boston. In my case, I am getting the Globe directly from them, as they have an open collaboration with the Center for Civic Media, where I am now based. 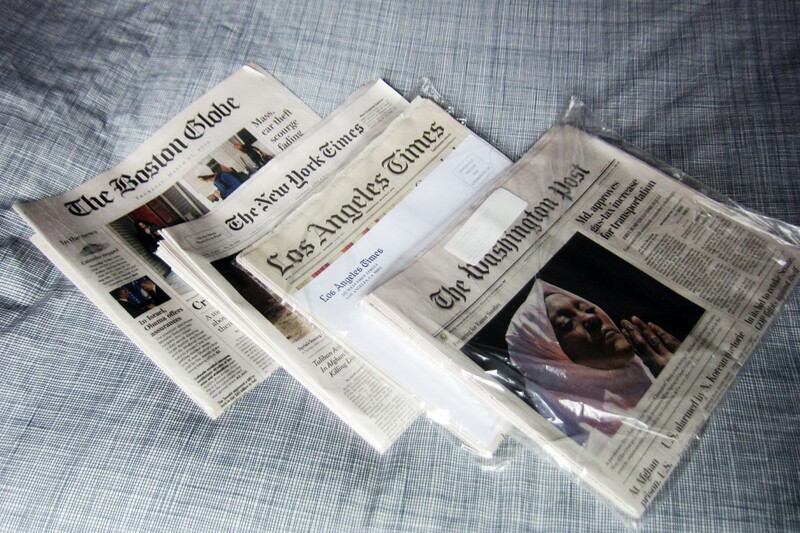 It got more complicated when I went to buy Los Angeles Times and the The Washington Post. It is not possible to buy them in Boston. I went to the bigger news stands and called the newspapers directly: they are not sold in the region, and I guess it would happen the same in other regions of the US. 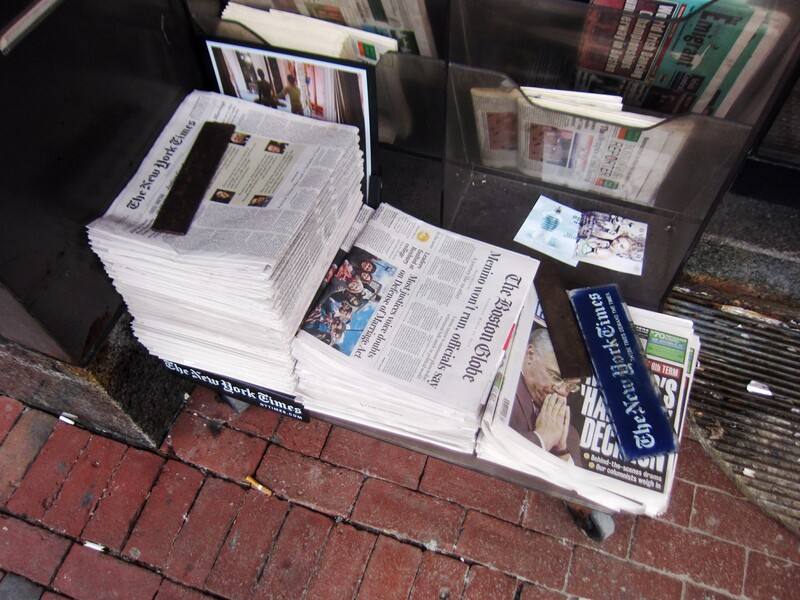 You can get Le Figaro or Le Monde with some days of delay, but not LA Times or Washington Post in the classical “Out of Town News” in Harvard Square. Anyone needing proofs that print press are having a bad time? So, my next step was to subscribe to those newspapers. After a few phone calls I was able to subscribe to The Washington Post that Saturday for 4 weeks for $72, initially I had to buy at least 8 weeks. To get copies of the previous days I would have to pay the standard fee $10/copy. I also tried to get an online access as a subscriber, but it was not possible with my post subscription. They told me that I would receive the Washington Post told with a 2-4 days latency. Los Angeles Times offices were not opened on weekends, so I had to wait until Monday to get the 8 week subscription, the minimum required, for $167. Luckily, I was able to get the papers from the days previous to my subscription. I would receive the papers with a 7-8 days latency, as they send them through regular post. I hadn’t had the newspaper at home everyday since I was living with my parents. Finally directly in touch with the objects I’ve been studying all these past months: paper front pages. I could physically experience the overload of information and advertisement, piles of papers piling up on top of my closet. I could also see the above and below the fold news and experience the difficulties of the paper navigation. I find it really difficult to read these huge newspapers that are split into different booklets that fall apart when you open them. I also found the full page ads in the last page, which would be a great second phase of this project, a LastPageX visualization. By now I have all NYtimes and Boston Globes since day one (March 26th). I am missing LA Times papers since April 9th (congruent with a 7 day latency), and from The Washington Post I miss the period March 26-29, April 8th, and since April 12th. I have to start the installation this Wednesday April 17th. Therefore, for the newspapers that would have not arrived by then, I will have to use printed copies of the front pages, or maybe display a 404 error white page? It’s being a good experiment on how difficult it is to get the paper copies of these newspapers. I can test now what I had written in the PageOneX description hundreds of times: that digital coding would avoid the problems of buying and storing newspapers. One night the guy from the convenience store told me, when I tried to buy the NYTimes in his shop: we don’t sell newspapers, why would we when you can read them online? I also coded Gay Marriage and Cyprus economic Crisis news, but I think there was not enough and continued coverage to include them in the graphic. International War conflicts: Syrian, North Korea, Afgahinstan, Iran and Isael-Palestina. Guns: the debate on gun control and killing by guns in the US. Sports: basketball, baseball, golf, wrestling, marathon. I am still open to suggestions! Bear in mind that what ever topics I select, I’ll have to manually cut the transparent pieces of colored plastic to put on top of the newspapers. Want to join the coding process? I will be reading papers + cutting plastic sheets from this Wednesday until Friday. Contact me or leave comment in this thread if you want to join. It’s going to be fun to have access to all these newspapers. PS: when I was about to close this post, the Boston Marathon explosions occurred. How will it influence press coverage and media attention these following days?